The Form No. LLC-5 - Abstract of the Pennsylvania Child Labor Act Form (Rev 1-13) is a child labor law poster by the Pennsylvania Department Of Labor & Industry. This poster is mandatory for some employers, including employers of minors. This poster must be posted in a conspicuous place where any person under age 18 is employed in Pennsylvania. It specifies rules on the number of hours and work times that can be assigned to minors of different ages, and specifies certain exemptions to various child-labor regulations. It appears you don't have a PDF plugin for this browser. 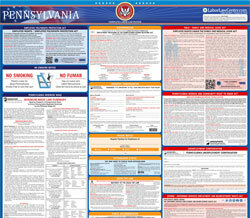 Please see the link below to download pennsylvania-llc-5.pdf. the Act or its regulations. and hours of employment and granting permission to work. additional hours on Saturdays and Sundays. not exceeding eight in a day. Employment prohibited after 7 p.m. and before 7 a.m.
Employment prohibited before 6 a.m. and after 12 a.m.
*  Minors employed as sports attendants are not subject to the Act’s hours and work time restrictions. Public School Code are not subject to the Act’s hours of employment or work time restrictions. counselor by a summer resident camp operated by a religious or scout organization. 30 MINUTE MEAL PERIOD REQUIRED ON OR BEFORE five CONSECUTIVE HOURS OF WORK. in the Act or its regulations. •   Live performances—maximum number: three/day or 10/calendar week (Sunday—Saturday). •   Non-work time at place of employment includes education, rest and recreation. school days or by 12:30 a.m. on evenings preceding nonschool days. •   12 hours must elapse between time of dismissal and time of call on the following day. consecutive days, but may not work in excess of eight hours in 24-hour period. compulsory attendance under the Public School Code.